Simon & Schuster/Paula Wiseman Books, 9781481416009, 40pp. Marie Tharp was always fascinated by the ocean. Taught to think big by her father who was a mapmaker, Marie wanted to do something no one had ever done before: map the bottom of the Atlantic Ocean. Was it even possible? Not sure if she would succeed, Marie decided to give it a try. Throughout history, others had tried and failed to measure the depths of the oceans. Sailors lowered weighted ropes to take measurements. Even today, scientists are trying to measure the depth by using echo sounder machines to track how long it would take a sound wave sent from a ship to the sea floor to come back. But for Marie, it was like piecing together an immense jigsaw puzzle. Despite past failures and challenges—sometimes Marie would be turned away from a ship because having a woman on board was “bad luck”—Marie was determined to succeed. And she did, becoming the first person to chart the ocean floor, helping us better understand the planet we call home. Award-winning author Robert Burleigh tells her story of imagination and perseverance. Beautifully illustrated by Raúl Colón, Look Up! is a book that will inspire readers to follow their dreams. Though her discoveries were pivotal to the theory of plate tectonics, geologist and cartographer Marie Tharp is still relatively unknown. In this picture-book biography, Burleigh presents Tharp’s story in her own enthusiastic, imagined voice. “Maps. I love them!” she exclaims before describing her life and accomplishments. In a conversational tone, she discusses her curiosity, her struggles to be accepted in the boys’-club atmosphere of 1950s research labs, her dogged determination to work in science, her belief in her sea-floor-mapping project, and her satisfaction at seeing her beautiful map gracing the walls of schools and museums. Along the way, she explains depth soundings, cartographic concepts, and plate tectonics. Colón’s soft colored-pencil illustrations are a wonderful match for ocean scenes and frequent maps, and a few helpful diagrams further illustrate concepts... very worthwhile. Further reading and some provocative critical-thinking questions close out the volume. describes her passion for maps and imagines one speaking to her: “Have an adventure. well as to the importance of other women scientists, past, present, and future. a bibliography, websites (one with a slight error), and related activities. Burleighand Colón follow 2013’s Look Up! with the story of another female scientist,Marie Tharp. 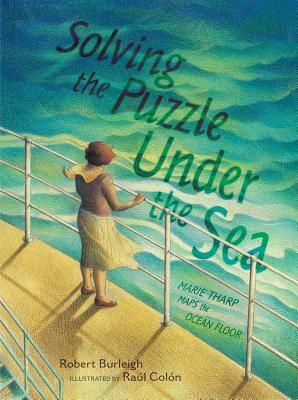 Raised by a mapmaker, Tharp developed an early interest inexploring uncharted land; her passion eventually led her to the oceans.Burleigh gives readers an up-close view of Tharp’s experiences and hunchesthrough a first-person perspective: “Could the seafloor really be mapped? Ithought so—and I wanted to give it a try!” Despite discrimination she faced asa woman, Tharp became an accomplished scientist, mapping the Atlantic usingsoundings and helping advance the theory of plate tectonics. Colón’s warmwatercolor-and-pencil art brings warmth and energy to the pages through histhatched and wavelike textures, while an afterword provides further detailabout Tharp’s undertaking. Ages 4–8.